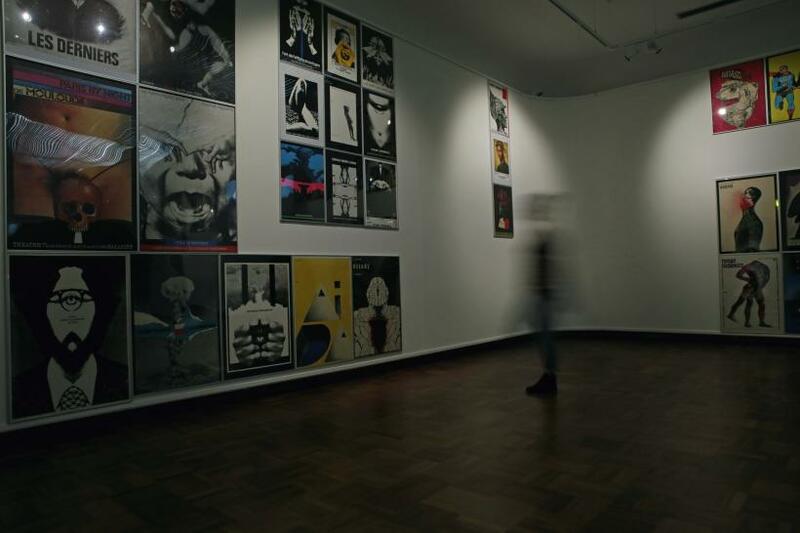 Title : Installation view of posters by Roman Cieślewicz, Tomorrow Was a Montage, Cooper Gallery DJCAD. Photo: Kathryn Rattray 2015. Courtesy of Cooper Gallery DJCAD, National Museum in Poznan and the Estate of Roman Cieślewicz. Title : Detail view, Wojciech Bąkowski, Making new worlds instead of forgetting about it, 2010, Tomorrow Was a Montage. Cooper Gallery DJCAD. Photo: Kathryn Rattray 2015. Courtesy of Cooper Gallery DJCAD and the artist. 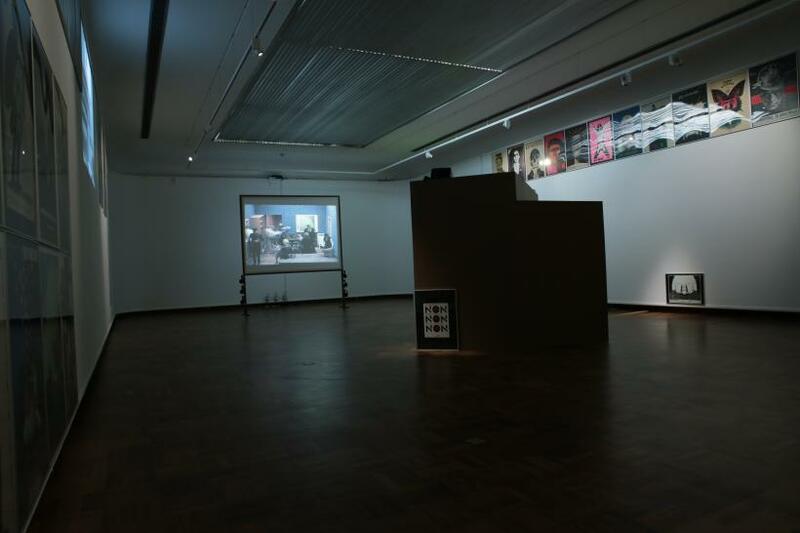 Title : Installation view of Tomorrow Was a Montage, Cooper Gallery DJCAD. Photo: Kathryn Rattray 2015. 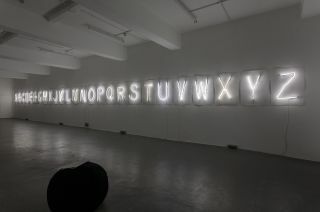 Courtesy of Cooper Gallery DJCAD. Title : Zbigniew Rybczynski, Tango, 1980. 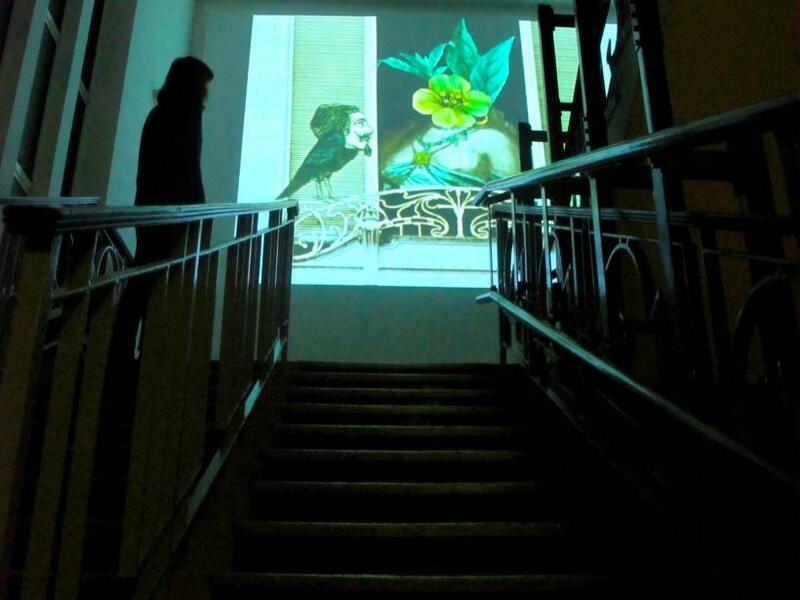 Installation view of Tomorrow Was a Montage, Cooper Gallery DJCAD. Photo: Kathryn Rattray 2015. Courtesy of Cooper Gallery DJCAD and Zbig Vision Ltd. 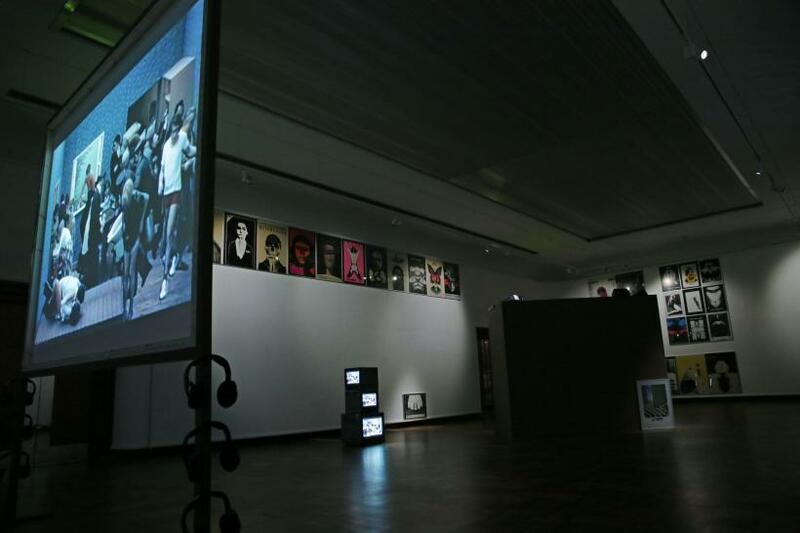 Title : Installation view of Jan Lenica, Labyrinth, 1963, in Tomorrow Was a Montage, Cooper Gallery DJCAD. Photo: Kathryn Rattray 2015. 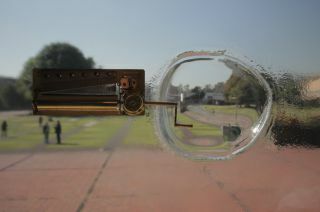 Courtesy of Cooper Gallery DJCAD and Studio Miniatur Filmowych. 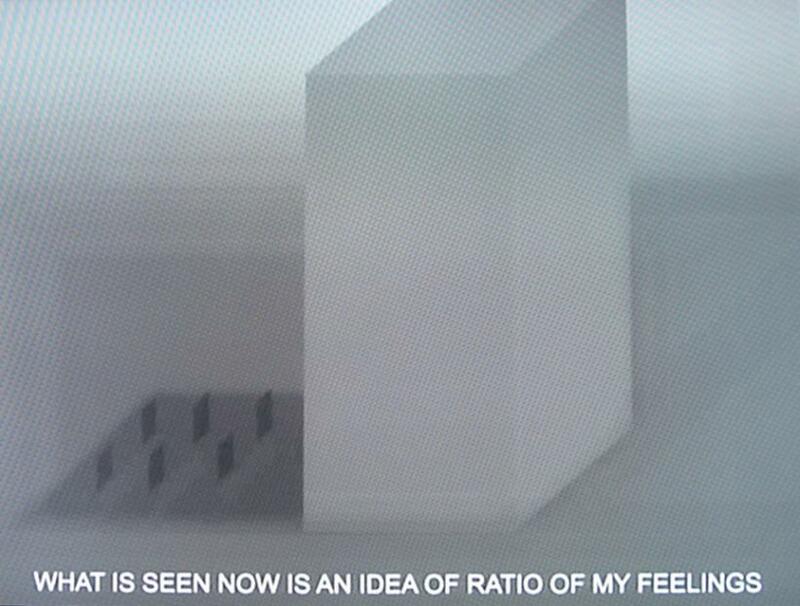 Title : Wojciech Bąkowski, still from Construction of the day, 2013, in Tomorrow Was a Montage, Cooper Gallery DJCAD. Photo: Kathryn Rattray 2015. Courtesy of Cooper Gallery DJCAD and Wojciech Bąkowski. 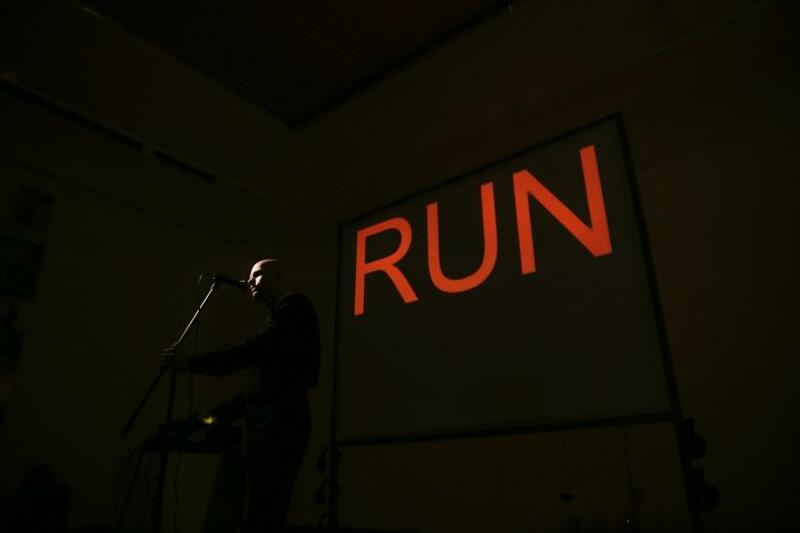 Title : Wojciech Bąkowski performs TELEGAZ, 2015, during the preview of Tomorrow Was a Montage, Cooper Gallery DJCAD. Photo: Kathryn Rattray 2015. Courtesy of Cooper Gallery DJCAD and Wojciech Bąkowski. Three film booths made for individuals - solo cinemas in shipping crates painted austere grey - meet the audience in the entry foyer to Cooper Gallery’s current exhibition ‘Tomorrow was a Montage’. This austerity, these claustrophobic soundproofed boxes, form a design to the exhibition which predominately isolates the viewer in close quarters to the images on screen and brings about a sense of self-consciousness as the exhibition opens up its exploration of the visual languages and polemical politics of the Former East in the 1960s and 1970s. Its legacies are scrutinized alongside contemporary practice, permeated with that era’s sensibility of high alert, provocation and disquiet. Montage here is about the potency, force and influence of images. Drawing new purpose from ready-made pictorial materials makes them alloys. 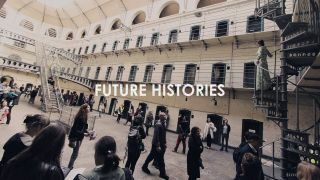 They formulate alternatives (social, political and personal) through the imaginative impossibility of their new engagements. Images and fragments are patched into new scenarios distant from their points of origin. Recruited for new purposes, they are recycled to redefine. 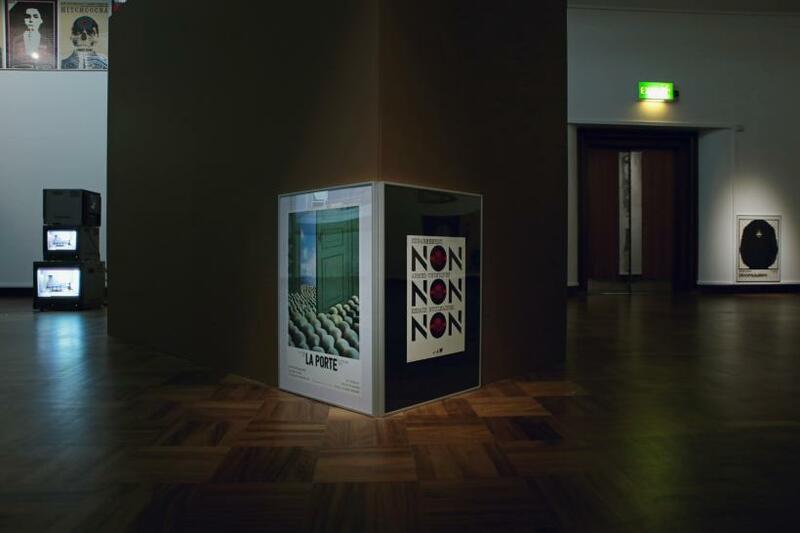 Polish graphic designer Roman Cieslewicz’s posters dominate the main gallery. The hanging of this collection of sixty works is a collage in itself. Images – often of a manipulated human head – are featured in tight clusters, or arranged in single file from the high to low. 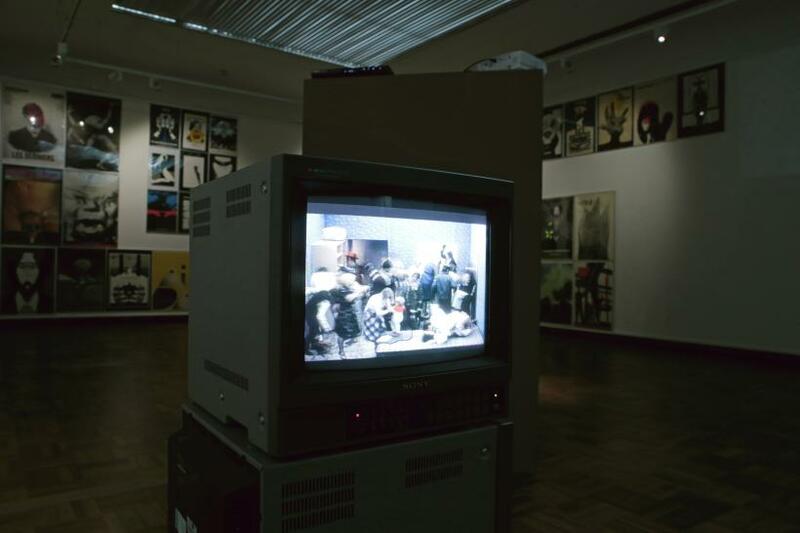 They are interspersed by video projections or arranged alongside stacked up monitors, becoming sculptural objects or corner pieces to another of the exhibition’s film booths. Cieslewicz’s communication art exists as a single visual entry point to an exhibition, event, theatre piece or film: a Kafka play, a film poster for Hitchcock’s Vertigo, an exhibition of Russian Constructivism at the Pompidou Centre or experimental performance art. The effect is of high culture impacted by lo-fi cut and paste, pre-Photoshop physical actions of the hand: cutting, splicing, pasting, affixing, overlapping and mirroring. These are experimental images bound up with function, eclectic hybrids with clean sans serif typefaces imparting solid knowledge. The posters are accompanied by animations by Wojciech Bakowski resembling early computer game interfaces or single player shooter games, pre-rendered of any effects, lighting or surface texture that brings about their sense of realness. The videos’ ambiguities, asceticism and screenings in solitary confinement form an abrasive juxtaposition to the hyperactive social energies of Cieslewicz’s poster designs. This hyperactivity finds parity with Zbigniew Rybczynski’s video ‘Tango’ from 1980. A single sparse bedroom becomes the site of action for an ever-growing series of characters from different classes and situations to intermingle, possessed entirely by a single deed: they enter; perform their action, repeat and exit. Cut from real-time video footage and using performance as a kind of collage its signals contemporary works and artists like Rachel MacLean, Catherine Sullivan’s ‘The Chittendens’ from 2005 with its archetypal characters from the leisure classes playing out sequences of actions in derelict offices or Candice Breitz’s cut out amalgamation of characters from across the history of Hollywood cinema. For its pioneering animation and future-telling speculations on appropriated media, ‘Tango’ won an Academy Award in 1983. Evidence of montage as experimental live composing and ruptured editing, of sampling, remixing and improvisation, is found throughout the exhibition and was particularly apparent in its opening night performance by Wojciech Bakowski. 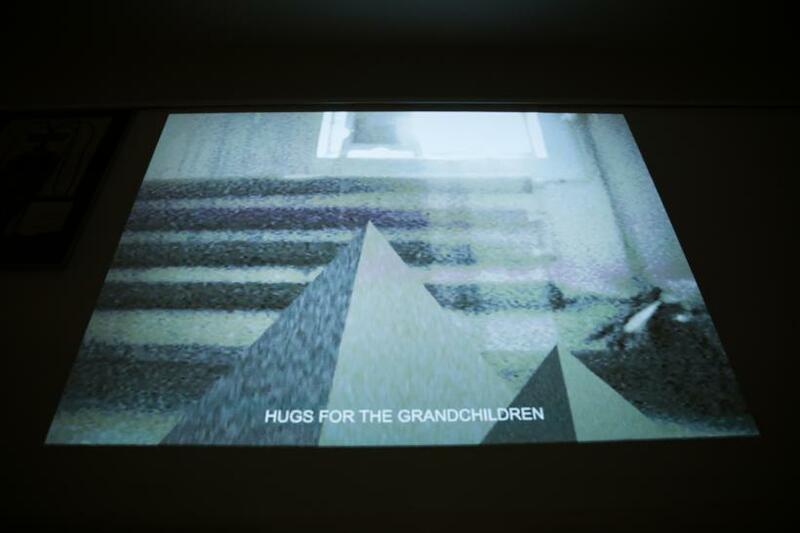 He presented a series of sound and video collages, melding pre-recorded sampled music, found sound and live voice. The aesthetic here resembled the paired down elegant simplicity of German electronica - Kraftwerk or Deutsch Amerikanische Freundschaft. He introduced, with appreciative gestures, works with titles such as ‘Liquid World’, ‘Astronaut Street’ or ‘Falling Asleep Out of Anxiety’. This final title can be taken as a slogan to the exhibition itself: external tensions accessing the subconscious mind, the conjoining impossible physics of dreams, brittle images then brought forward, embossed by unrest.